1941In our casual, sometimes downright shabby culture, it’s difficult to imagine a time when people gussied up before going out to dinner, lunch, or even tea. Dining out was as much a social as a gastronomical experience, and people dressed for the occasion. 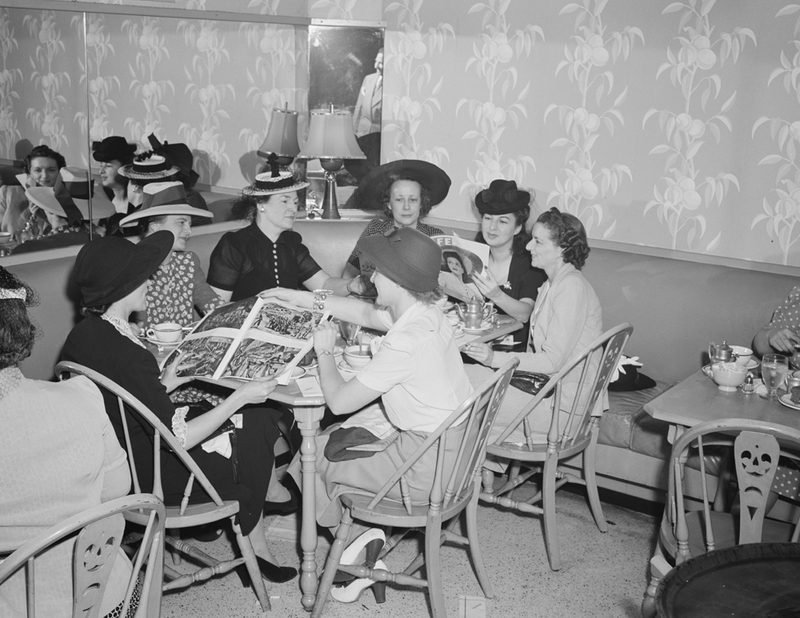 For women, in a certain era, donning a hat was de rigueur, as this 1941 shot of Crowley’s Mezzanine Tea Room in downtown Detroit attests. Although not as large or as deluxe as Hudson’s, Crowley’s was nevertheless an elegant emporium that sold a bit of everything. Technically, its name was Crowley-Milner & Co., but most Detroiters referred to the conglomerate at Gratiot and Farmer simply as Crowley’s. (William L. Milner was a Toledo-based businessman who partnered and invested with the Crowley family.) Interestingly, the lovely 1906 glazed brick and white terra-cotta six-story building was not built for or by Crowley’s, but by the retailer Pardridge & Blackwell. However, an economic downturn battered that department store and, by 1909, the business was run by Crowley-Milner. Crowley’s at that time was hardly a newbie on the retail scene; it was already running a thriving dry-goods store on West Jefferson before moving into the building at Gratiot and Farmer. In short order, Crowley’s flowered, and another tower was erected, as well as a bridge that connected the two edifices. The store was renowned for its quaint but rickety wooden escalators. But as Bruce Allen Kopytek notes in his book Crowley’s: Detroit’s Friendly Store, the conveyances were not original to the 1906 structure, but were added later. By the 1970s, Crowley’s was a shadow of its once-shining self. In 1977, the wrecking ball came crashing into the downtown store, eradicating everything but sweet memories.